For the second month in a row, an electric car topped new car registrations in October in the Nordic country, where 716 Nissan Leaf were sold with an unprecedented market share of 5.6 percent. “Norway is showing the way out of oil dependence, or even addiction,” said Snorre Sletvold, president of the Norwegian Electric Car Association. From the modest Buddy, a locally produced two-seater urban car, to the US-made Tesla S, some 15,000 electric cars should be rolling on Norwegian roads by the end of 2013, 10 times more than in neighboring Denmark and Sweden. 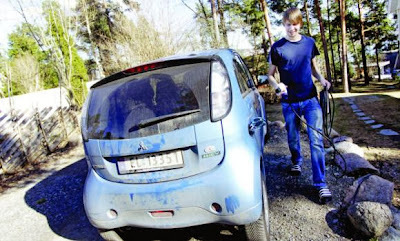 Electric cars still represent a small fraction of Norway’s car pool, but figures grow steadily every month. In total, they accounted for 7.2 percent of Norwegian auto sales in October, up from a 3.4 percent market share a year ago. Around 5,200 have been sold in the first 10 months of 2013 and new models by Volkswagen (including an electric version of its famous Golf), BMW and Renault are expected to hit the market in the coming months. In September, US-made Tesla S, Crown Prince Haakon’s personal choice, topped the sales list due to a backlog that had built up before the first cars were shipped to the country. Somewhat paradoxical in oil-rich Norway, this success can be partially explained by the numerous incentives intended to foster clean vehicle sales in the country. All electric cars in Norway are exempt from VAT and other taxes, public parking fees and urban toll payments, and are allowed to use bus lanes.